This week’s release of the Bitbucket add-on to the Open Science Framework (osf.io) provides OSF users with a way to cite, browse, and register their code on Atlassian’s Bitbucket cloud Git repository right from inside their OSF projects. This new add-on extends the OSF's storage and access capabilities to another community of users. Connecting and enabling services researchers use every day is central to the way the Open Science Framework supports the research lifecycle. The Center for Open Science is committed to continually meeting users where they are and enabling tools that support the way they prefer to work. 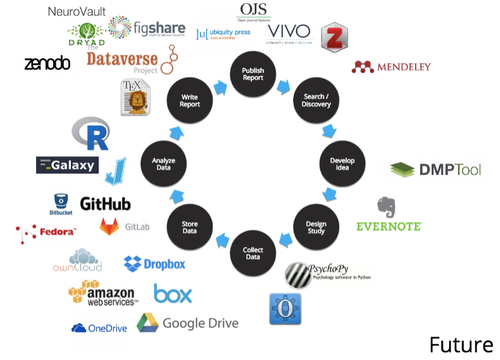 Researchers inside and outside the OSF benefit from the framework’s interoperability with other tools and storage allowing them to access, share, and analyze their data. 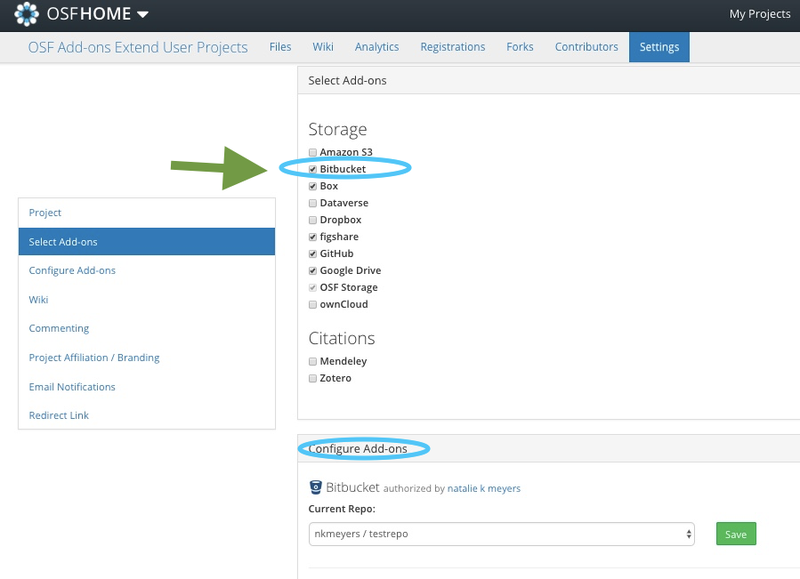 OSF storage add-ons allow users to mix and match resources on cloud storage inside their OSF projects and share them in one place with collaborators. OSF Users can learn more about how to connect to storage add-ons in the OSF Guides. Storage add-ons are some of the OSF’s most popular integrations. New add-ons and integrations are being developed all the time as tools are connected to the OSF. Below, on the left you see our add-ons as of early 2017. The diagram below right shows our interoperability goals for 2017. The next storage add-ons planned for release on OSF are: OneDrive, GitLab and Dryad. 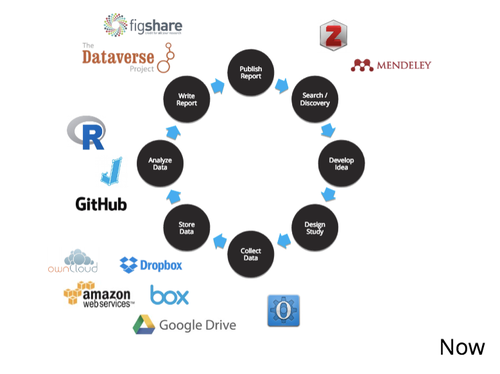 The COS Open Science Framework API and WaterButler data handling service together allow OSF users to access data directly from external storage providers like Github, Amazon S3, and Dataverse in the examples you see above. There are two halves to each OSF storage add-on: the OSF-side add-on and the WaterButler (WB) provider. The OSF side of the add-on handles the user interface, authentication, and defines the metadata model saved in the OSF database. WB is an external storage abstraction API. It allows the OSF to communicate with storage providers through a common interface. A WB provider translates the requests it receives into the format understood by the storage provider, then maps the storage provider’s response back into a common response format. Developers may be further interested to see an example of how these storage add-ons are accessed through the WaterButler service. Many of our in-development add-ons started life as a search and replace against the most similar existing add-on. Want to know more or develop an integration or add-on? We have an OSF API public project @ https://osf.io/y9jdt/, with examples and for receiving feedback on the public OSF API. Developers there can find Quick links to the API Dev Docs and see examples and a typical workflow. If you are interested in integrating with the OSF, we want to hear from you! Please contact support@osf.io. Bitbucket is a product of Atlassian where users can collaborate on code and manage their Git repositories to build and ship software, as a team.